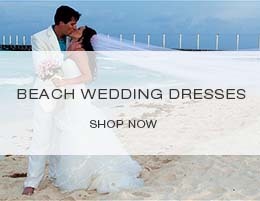 Since 2006 we have been putting destination weddings into color not only with our exclusive and unique designer styles of beach wedding attire for men, but also with our innovative customization processes that include numerous customizable clothing options such as color, style, and fit. 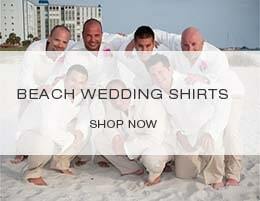 We design and manufacture all our formal tropical attire for every beach wedding individually. For 8 years of our work, we have dressed people for nearly 30,000 formal occasions. We know that planning and organizing a beach or tropical wedding is not easy. However, we believe that clothing matters should not add to the chaos, nor should you have to settle for a mass manufactured attire for your special day. When considering which formal or casual beach wedding attire to wear for your tropical wedding, there are three important aspects that should be taken into account: style, cut, and color. Without all three, it is not likely your clothing satisfaction level will reach the 100% mark. That is where we come in. We have taken care of all three of these aspects to create formal beach wedding outfits to satisfy even the most demanding couples. No matter the size or age of the participants- color choices or style requirements; we can dress your entire party and give you the exact formal clothing you are looking for that is made from only the highest quality, beach-friendly fabric and embellishments. With so many things to worry about during the planning phase of your tropical wedding, at least the “how to dress” problem will be crossed off of your list. 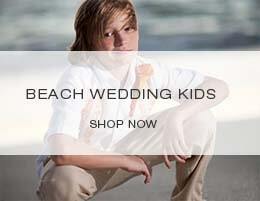 We offer over 300 embroidered beach wedding outfits for women, men, and kids that are available in 24 color options as well as in numerous color combinations. At our online store, you can find standard sized clothing and custom attire for those, who want their apparel to suit the style of their wedding party. 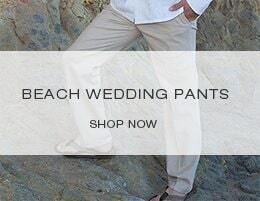 All wedding apparel is perfect for a barefoot walk down the beach. It will always please everyone’s eyes and look good in your wedding photos. Our outfits are available in two options: fitted and relaxed. The fitted formal attire is a tapered or fitted look, perfect for people with athletic or slender body types. The relaxed type is looser and more casual, ideal for people of large sizes or those, who enjoy more comfortable clothes. We can customize your formal beach attire by adding various button options made from a coconut shell or mother of pearl and altering the shirts’ sleeves according to your preferences at no additional cost. We also carry a large selection of accessories and beach footwear, as well as a wide selection of jewelry, hair accessories, cufflinks, and handkerchiefs. We are sure you will find something to your liking. If you have any questions, check out our helpful links or contact our customer support by e-mail or phone.